Access Publishing, the parent company of the Paso Robles Daily News, is producing the 2016 edition of Your Cambria Phone Book. It’s the only local, family-owned directory serving Cambria, Harmony, San Simeon and the North Coast of San Luis Obispo County. Over 6,000 copies of the new Cambria Phone book will be delivered to every home, apartment, and business in Cambria and surrounding areas. “If you are a local business looking to grow into the Cambria market, this is a great publication to be in,” says publisher Scott Brennan. The deadline for advertising is May 30. 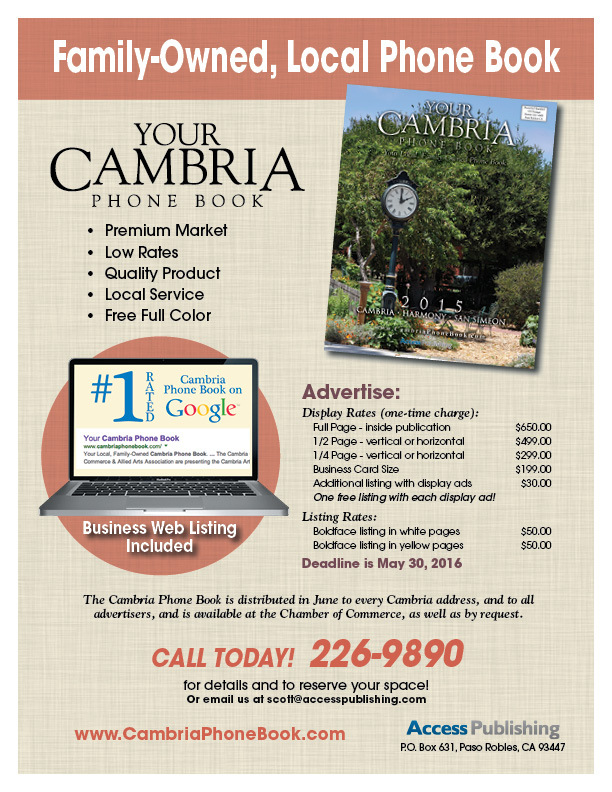 Your Cambria Phone Book is produced by local marketing and advertising company Access Publishing, based here in Paso Robles. The company publishes the Paso Robles Daily News, A-Town Daily News, San Luis Obispo County Visitors Guide, North County Access and others. It also provides online marketing, search engine optimization and web design in San Luis Obispo County. Call Access Publishing at (805) 226-9890 for more information.